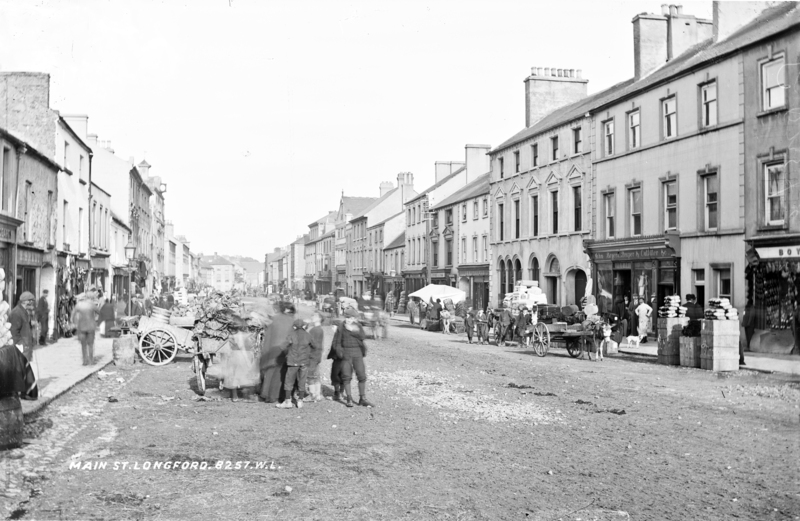 Starting this week with a Lawrence image of Main Street, Longford on a busy market day! I love shots like this with a wealth of detail, lots of people, animals, carts and produce on display. It will be difficult to date this from the evidence on view but we can enjoy all the atmosphere that Mr. French has so beautifully captured. [https://www.flickr.com/photos/[email protected]] Whats his name? Spot? The 1860 Bank of Ireland building at right with the arches was "renovated" in 1901, although it looks like a complete rebuild to me. When was the street paved or sealed? The railway was opened 1855. Looks like an ideal street for a Tram. Was there a tram? Not one motor vehicle on this street. When were they introduced? So, it could be narrowed down based on evolution of infrastructure. Notice the 8 chimneys and the clock tower or possibly a cupola, further down, on the left side of the street? Maybe a government building. Another possibility would be knowing what periods of time were a clothing style or hat worn. The clock and cupola are the court building, which is still there but without those features. There is a bit of a puzzle with the AIB gable-roofed building (see note). The NIAH - www.buildingsofireland.ie/niah/search.jsp?type=record&... - says it is 1920s, and indeed there is "1922" on the pedimant (see streetview). Anyone know how it is there 25 years early?! [https://www.flickr.com/photos/beachcomberaustralia] It is not the same building. They replaced this one in 1922 with another gable-roofed building. Apologies for banging on about the AIB building; seen here closer and more detailed opposite the Court House - catalogue.nli.ie/Record/vtls000318781/Image?lookfor=http:... . And it does not appear to be there in this reverse view - catalogue.nli.ie/Record/vtls000332575 . Very odd, but it should provide a 'later than' date. John Boyers (whose premises and merchandise seem to take up a fair chunk of the right hand-side of the street and photo) was there in the 1901 and 1911 census. No real help with dating. Though perhaps the people outside his premises are family or staff. (His second son, Edwin, aged 19 in the 1911 census, seems to have become a doctor and joined the Royal Medical Corps - this website records his death in October 1918 from "pneumonia as a result of service". No help with dating. But a sad read almost exactly 100 years later.) J(ohn) & M(ichael) Farrell appear a few doors down in the 1911 census; Brothers in business together as the signage here suggests. However, they were not working together in 1901. And instead are working separately (earning their stripes in the trade) as assistants in other peoples' businesses as of that date. Here is Michael working as an grocers assistant in 1901 under a man named Fitzgerald. And John also as an assistant elsewhere for a family named King. This to me puts the date almost certainly after 1901. 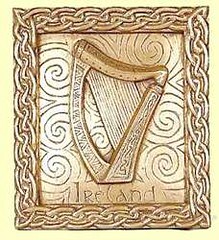 (Because sometime between the 1901 and 1911 census, the Farrell brothers stopped working for others - and started their own business). So, after 1901. Almost certainly. Legge, Shanley, Brady and Plunkett all appear in both the 1901 and 1911 returns for the main street, so they don't really help. Other than to put the date in the ballpark of the early 20th century. I don't see Brady's neighbours, [Heg]earty(? ), in either return, so no help there. I think that the Farrell brothers (J&M) have set up shop by the time of French's photo, however, at least puts us after 1901. PS: To my eye, there's a surprisingly high number of kids around that cabbage truck. Notice on the photo: "MAIN ST. LONGFORD . 8257 . W.L ." Have you identified and dated any other Robert French Lawrence Collection Photos with 8256 or 8258, for example. Were sequential numbers used or did they relate to date or file number or box of glass plates, etc. Must be a method to the madness for recording such information on the glass plate when developing.